PowerSefer is an e-sefer reader and library designed for the modern computer, with unlimited access to hundreds of classic seforim, beautifully reset in crisp, clear print. You can write in them, underline, highlight, bookmark unlimited pages, and make the text as large as you need. Search in one sefer or the whole library at once. Instantly search our entire seforim library for a word or phrase. Advanced search options allow you to match phrases with Hebrew prefixes, suffixes and more. Our specially-designed e-seforim make it easy to adjust the text size as large or small as you like. Write notes, add bookmarks, and highlight or underline passages. 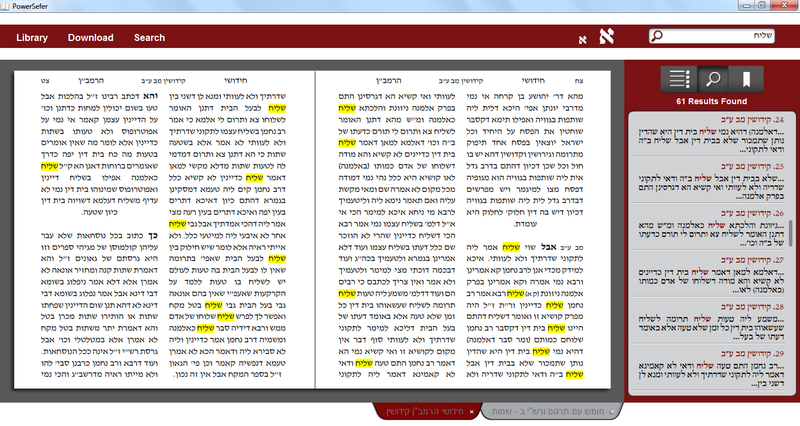 PowerSefer includes a built-in dictionary for instant access to Hebrew and Aramaic definitions and abbreviations. References from Tanach, Shas, and more can be opened as a new page with a single click. Browse our extensive library of seforim from the app and instantly download as many as you need. Detailed table of contents provides quick navigation within each sefer. Seforim include: Chumash (with Rashi and other commentaries), Nach (with Rashi and other commentaries), Mishna (with Bartenura), Rambam, Talmud Bavli (with Rashi and Tosafos) and Talmud Yerushalmi, Mishnah Brurah, and hundreds of seforim in many other categories, including Mussar, Chassidus, Kabbalah, Rishonim, Achronim, Halacha, Midrash, and more. PowerSefer is a free download, and includes 5 e-seforim – a full set of Chumash with Rashi. Purchase an activation key for just $49.99 to enable unlimited e-sefer downloads.